Throughout the history of mankind, urine ironically had different applications in various fields – ranging from use as fertilizer, a component for collecting saltpeter crystals (for gunpowder) to even a cleaning fluid and as an (alleged) extinguishing agent for Greek Fire. Well, this time around, researchers from the University of the West of England (UWE Bristol) and Oxfam have successfully utilized urine for the generation of electricity. The fascinating ‘pee-powered’ technology employs what is known as microbial fuel cell (MFC) stacks – and they harness energy by means of complex bio-electrochemical processes that entail real organic bacteria. 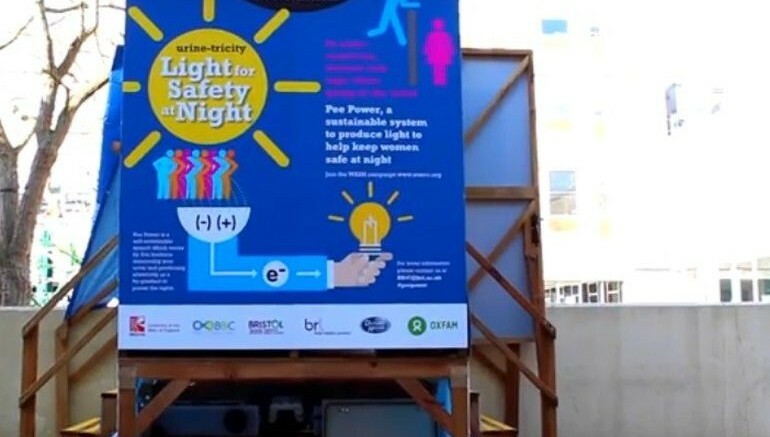 In other words, the urine can be categorically utilized for creation of electricity – and this where the expertise of Oxfam comes into the picture. Known for their sanitation solutions, especially in disaster areas, the pee-power technology can be used in urinals inside refugee camps. This nigh pertains to a symbiotic scope where the supply of urine (produced naturally by humans) can directly lead to the harnessing of sustainable power. The ‘green’ power in turn can be used for safety lights in the toilet areas which are particularly vulnerable to assailants during the night time. Of course, the ambit of technology is not always enough when it comes to a practical scenario; the situation is also influenced by the cost factor. To that end, the pee-power technology might just make its case, with Professor Ieropoulos touting each MFC setup inside the toilet to cost around a feasible £600 (around $900).